Definition: The Expansion through Diversification is followed when an organization aims at changing the business definition, i.e. either developing a new product or expanding into a new market, either individually or jointly. A firm adopts the expansion through diversification strategy, to prepare itself to overcome the economic downturns. Concentric Diversification: When an organization acquires or develops a new product or service that are closely related to the organization’s existing range of products and services is called as a concentric diversification. For example, the shoe manufacturing company may acquire the leather manufacturing company with a view to entering into the new consumer markets and escalate sales. 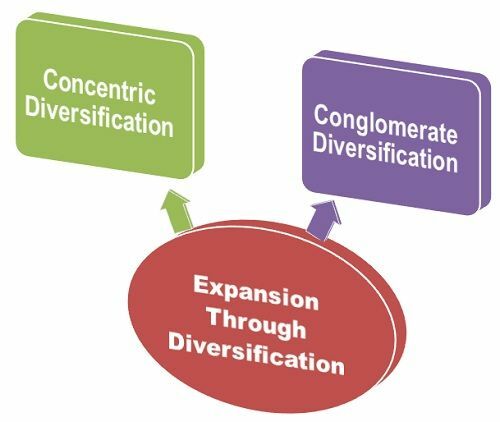 Conglomerate Diversification: When an organization expands itself into different areas, whether related or unrelated to its core business is called as a conglomerate diversification. Simply, conglomerate diversification is when the firm acquires or develops the product and services that may or may not be related to the existing range of product and services. Generally, the firm follows this type of diversification through a merger or takeover or if the company wants to expand to cover the distinct market segments. ITC is the best example of conglomerate diversification.